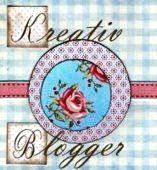 Its a lovely award as its a 'Kreativ Blogger' which means a lot, as I assume I've received it for my creative thrift finds, LOL!! 1. I love boot sales and charity shops-I would say 90% of my wardrobe is from them and I just enjoy the thrill of getting a designer or vintage bargain!! 2. I'm not a big eater, but I'm always thinking about food, I would definitely dine out more often if my expenditure allowed!! 3. I get a lot of my inspiration from fellow bloggers, magazines such as Grazia, Elle and Vogue and internet sites such as Net-A-Porter, My-Wardrobe.com and Topshop. 4. I enjoy walking-I don't exercise at the gym, but I try to walk at least 20 minutes a day. 5. Favourite daytime programmes include-Trash to Cash, Dickinsons Real Deal, Put your Money where your Mouth is. All antique and boot sale orientated-I love to see items up at auction and would love to go to an auction house for the day!! 6. I enjoy holiday time off for one main reason-no early starts!! 7. I hate food shopping when I have to go in the supermarket to buy it, but adore doing it online-15 minutes and its all done for the week and delivered straight to the door too! 8. I wish I could use my sewing machine-pure laziness just stops me from setting it up and getting going, LOL!! 9. I generally love colours and patterns in my wardrobe, but I've enjoyed putting quite a few black pieces in for long term wear. 10. The only gadget I really value is my IPOD-I enjoy listening to music and should do it more often!! For all of their stylish and creative ways!!! congrats for the award!! i get inspirations from fellow bloggers and magazines too!!! OMG YES! I hte early starts. I am simply not a morning person. AT ALL. congrats honey, like you i love walking too and im so not a gym person. embarrassed to say ive never used one! I have a mini ipod which i havent used in months, i sort of forget i have one! cool about the award. Yeah, I need to use my sewing machine more too. Congrats on your well deserved award! Loved learning more about you from the tag. Hope you have a lovely weekend! OMG! I walk and Hula hoop because I don't like to exercise! I have to try the online Grocery Shopping because I dread standing in line on Sundays to shop for the week!!! Hello, I've just discovered your blog which is amazing !